New Maserati Granturismo MC Stradale | What Car? 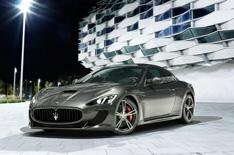 The updated Maserati Granturismo MC Stradale has joined the new Quattroporte on the manufacturer's stand at the Geneva motor show. The high-performance version of the Granturismo Coupe has four seats compared with the current car's two-seat layout. It's powered by a 454bhp 4.7-litre V8 engine that drives the MC Stradale to a top speed of 188mph. Maserati hasn't revealed the car's 0-62mph time, but expect it to be around 4.7 seconds. The MC Stradale gets a six-speed robotised manual gearbox and carbon-ceramic brake discs. Other changes over the standard model include a carbonfibre bonnet, a more aggressive-looking rear diffuser and bespoke 20-inch alloys. Average economy hasn't been confirmed, but we expect both economy and emissions to improve compared with the outgoing car's. Expect a starting price of more than 110,000 when the car goes on sale this summer.